Bonnie (my sister-in-law of 50 years) and I were visiting this week about how hard it can be to cook for just 1 or 2 people. We regularly cook for 2 and we don't like to eat leftovers for days. Myrna and I have a few ideas to share that work for us and give us more variety with less waste. I hope a few of them will work for you too. Myrna says: Sue and I talked about this at coffee time after she had visited with Bonnie. My household is now down to just me and I am finding it hard to cook or make myself eat a decent meal. One of the ways I have found that helps is to set the table with dishes NOT PAPER PLATES. Sitting down to a meal dished up and looking good certainly helps with a better attitude to the food. Yes, it makes a few dishes but it also seems to help me eat. This is where I agree with Sue that smaller appliances and dishes make your food look more appetizing. When you can, do like we do, and buy from a store with a meat market. It helps as they are more than willing to sell you a smaller amount. I find freezing leftovers just ends up with me having leftovers that don't get eaten, the exception being rice and potatoes. I now use my Breville more than ever and my coffee pot makes a very good one to four cups of coffee though pouring the leftover in a vacuum bottle works well. I find I am making things like homemade gravy mixes so I can just measure out and make enough for one serving. Try to keep your half packet of a mix labeled with the amount of servings and than like Sue says in a bin where they will stack standing up so you can see them and not have them tip over and spill out. I will now pay a few more cents for a smaller size of perishable foods so that I eat it and the rest doesn't get thrown away. Keeping a list or at least a menu plan works the best for me. I think the best thing is buying some smaller size pans as that helps it seem like you are cooking enough instead of just one lonely potato or 2 eggs in a large pan. That is when the temptation to add more comes into play. Maybe its time to treat your self to a new pan or two? I use a monthly rotating menu, of just the protein item I want to use for our main meal. For example; I include my prepared dishes from the freezer, or meats, beans, eggs, fish and seafood, and poultry items. If I spread them out during the month I use some of everything I usually keep on hand, without repeating too many meals. It's really just a list to keep me on track, and it's subject to change. Each week I strive for a day for fish or seafood, a day for poultry, a day for beef, a day for pork/ham/sausage, a day for beans, split peas or lentils, a day for eggs and/or cheese each week. The 7th day is cook's choice. I decide on what recipe to make with the item on the list depending on the time of year and what's already on hand, salads in summer and soups in winter for instance. I have eliminated any recipes my husband or I don't both really like, and even a few items I used to stock that I found out my husband didn't care for and I didn't think I'd miss. Then I repeat that rotation of basics the next month. A good quality toaster oven like Cuisinart, Krups or Breville – I bake quick breads, muffins, cookies, pies, fish, chicken, chops, small casseroles, etc. in mine – they only take 5-10 minutes to preheat, as well as using it to make toast. You will use a toaster oven like this so much; it pays to invest in a good one that has good temperature control. Look for them on sale. Maybe a small George Foreman type indoor grill that cooks one or two servings. 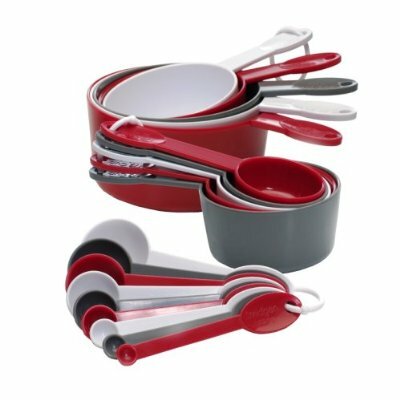 Look for a measuring cup and spoon set that contains lots of sizes - this set ranges from 1/8 cup to 2 cups...and the spoons have a big variety - from 1/32 teaspoon on up. These help you halve recipes without having to do so much math and cost less than $10. I’ve found a 5” x 7” shallow glass refrigerator dish holds half of an 8”x8” or 7”x11” recipe – or ¼ of a 13” x 9” recipe. I have bought these dishes at both Walmart and Target. I have several for baking casseroles. I have several small 8” pie plates (old) that hold only 2 cups of filling – half of a usual pie plate. Look for them at antique malls, etc. I paid $1 each. Then I make a half recipe of filling or a full recipe and freeze the rest for the next pie. Buy several sizes of custard cups and ramekins for desserts and even things like corn custard, etc. I have also made cornbread in greased custard cups. Corning ware makes several nice individual casserole dishes – 6, 10 and 12 ounces. 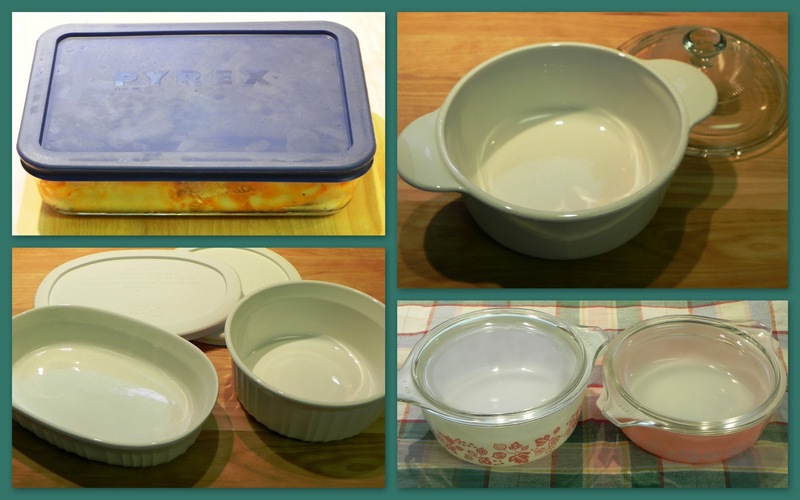 Old Pyrex casseroles that were originally intended as refrigerator dishes hold small portions. Buy several quart or quart and a half saucepans. Buy an 8” cast iron frying pan – it will also bake a cornbread mix or an upside down cake with a Jiffy mix as well as sauté smaller portions of meat, poultry and eggs. Mine holds about half of what my 10” fry pan holds – for casseroles too. Split mixes like cake mixes, muffin mixes, pudding mixes - Weigh the mix or measure the whole thing, divide in half and add half of the remaining ingredients. You’ll only have to get this measurement once; then add it to a list so you’ll remember it. For example, ½ of a 2 layer cake mix is about 1 ¾ cups, you need 2/3 cup water, ¼ cup oil and 1 egg to make a single layer or 6 cupcakes. Buy single layer cake mixes like Jiffy. Bake cupcakes instead of cake...easier to freeze for single portions later...frost them when you serve them. Use a medium egg for half egg – buy medium eggs, use one for half an egg in most baking recipes. I save the smaller farm eggs I get for this purpose. A half egg is also 2 tablespoons of beaten egg. Freeze cookie dough – either refrigerator dough in rolls, or drop cookies in scoops and freeze – bake from frozen, just a minute or two longer than the recipe, whenever you want. Freeze finished cookies and bars – they will thaw while you make tea or coffee, and you may be able to serve a few different kinds to surprise guests. Freeze breads of all kinds – I usually slice first. Freeze pie fillings in small portions, like pumpkin, fruit, etc. – bake later in small pie pans or custard cups (I use quart freezer bags stored flat). Try turnovers or bake small cups of pie filling topped with a round of pie crust. Turnovers freeze well. Freeze pie crusts in individual sizes – about 5 ounces of pie crust works in the small pie pans – I freeze dough in patties this size, let thaw and roll out as usual. You can also roll out, separate with 2 sheets of waxed paper and freeze flat on a paper plate in a plastic bag. Toast leftover biscuits (top with butter, sugar and cinnamon), and toast and butter cornbread leftovers in your toaster oven or serve either one topped with sausage gravy, creamed eggs, or hot chili. Freeze extra waffles and French toast, toast one or two at a time. Microwave frozen corn muffins 15-20 seconds and then toast them in your toaster oven until crisp...just like fresh baked! Home can in small jars – meat, poultry, soups, soup vegetables, any vegetables, fruits in pints, 12 ounce or ½ pint jars. Use thick white sauce– no need to have leftover cream soup. If you freeze leftovers or small portions, keep track of them in plastic baskets in your freezer. Check there first when meal planning. Cook wild rice, regular rice, and dry beans in a larger quantity and freeze in small portions – I usually freeze in 1 cup portions to use in smaller recipes. Freeze soups in one or two portions. Freeze salsa or spaghetti sauce for cooked dishes – I get three 1 cup portions from a large purchased jar. Make patties and meatballs instead of loaves – they cook more quickly too. Put extras in the freezer for another day, or try small loaves. Freeze baked bacon – lay out on parchment or waxed paper, roll up and store in gallon bag – remove the slices you need and microwave. To bake, place on a rack in a sheet pan at 400° for 20 minutes. Try freezer mashed potatoes – freeze one or two servings in quart freezer bags, thaw, and cook in a large custard cup or small casserole in the microwave. Make fresh salad dressings...no bottles languishing in the fridge. Try Vinaigrette dressings or Creamy Dressings; they last several days. Clockwise, top right: Cheese shells with sauce, lemon juice, spaghetti sauce and canned tomatoes, cooked brown and wild rice, small meat market packages, frozen fish sticks portioned out of a BIG bag. Portion meat when purchased, packaged for 1 or two – at our grocery meat counter they will package them for you in small sizes. You can use more packages if you have company - they often thaw more quickly too. 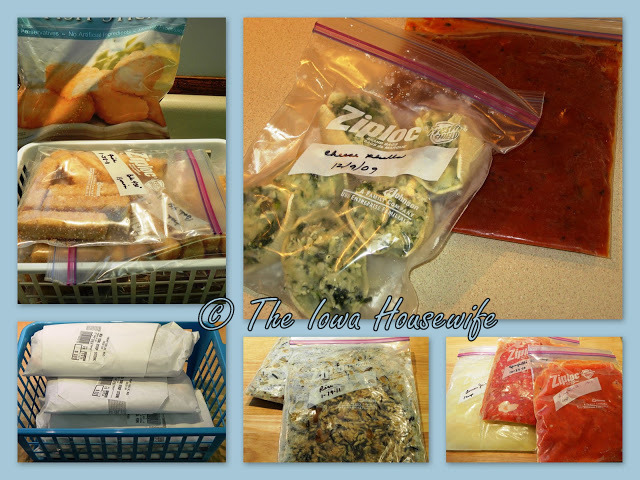 Portion lunch meat and cheese in sandwich-size bags placed in a freezer bag for quick sandwiches that thaw in minutes. You can even freeze braunschweiger slices and sliced summer sausage. They thaw quickly. Individually wrapped cheese slices freeze OK and if you remove the wrap before thawing so it doesn't stick to the slice, they will thaw quickly for grilled or meat and cheese sandwiches. I often use snack-size bags for home-grated Parmesan or any grated cheese, for instance, kept in a larger freezer bag, no moldy cheese! Package large bags of frozen items into portions, place in quart-sized bags and put the bags back into the large bag in the freezer on shopping day...take out your pre portioned bag to use. I do this with fish portions, tater tots, etc., and those Big bags of frozen veggies and fruit from Costco or Sams. This seems to cut down on ice crystals from opening the big bags too often and letting warm air contact the contents. Use frozen vegetables purchased in a bag – shake out just what you need. I keep one basket of partial bags in my kitchen freezer; occasionally combining the ingredients of several to get a serving or two of "mixed" vegetables, or to add to quick soup. I freeze chopped onion and green or red peppers and keep them in bags in a basket in the freezer...I can break off or shake out just what I need. I've found most canned ingredients freeze well: half cans of tomatoes, spaghetti sauce, half cans of beans like black beans and kidney beans (rinsed and drained), half cans of cream soup and canned mushrooms are items I regularly freeze. I keep the bags together in a box in my kitchen freezer, and look there first before opening anything else. I keep a box or basket of packages of cooked rice in right-size portions in my freezer too...just heat them in the microwave when I want to add them to stir frys, serve chili over them, or use as a simple buttered side dish or add to rice pudding. Make a mess once and serve several times is an idea I like. I keep a dedicated shelf in my upright freezer for freezer meal items like homemade meatballs, cheese shells, cooked roast portions with gravy, cooked diced chicken, premade uncooked ham and beef patties, freezer mashed potatoes, cooked Swiss steak, prepared chili, Spanish rice, etc. all in meal-size portions in freezer bags frozen flat separated into baskets. If I fold a quart bag over about in half, I can make the frozen contents fit in those 3 cup 5x7" casserole dishes, ready to microwave after thawing overnight in the casserole dish. My other shelves and the roll-out basket are dedicated to 1) Beef 2) Pork, ham and sausage 3) Chicken and seafood. I hate to search too much! In the door I keep frozen butter, lard and extra dry milk. In my kitchen freezer I keep baskets or freezer boxes of shredded or sliced cheese (portioned out), a basket of bags from half cans of items like tomatoes, beans, canned tamales, etc., a basket for chopped onions, peppers, mushrooms, caramelized onions, etc. This is my go-to before I open any can to see if I have these already. This is where I also store my frozen vegetables and potato items so I see them and don't buy too much, as they go on sale frequently. 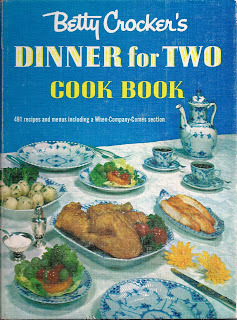 Myrna and I both have and like the Betty Crocker’s Dinner for Two Cook Book from 1958. The portions were much smaller then, and the recipes are just right for one or two people – you can double them for company. 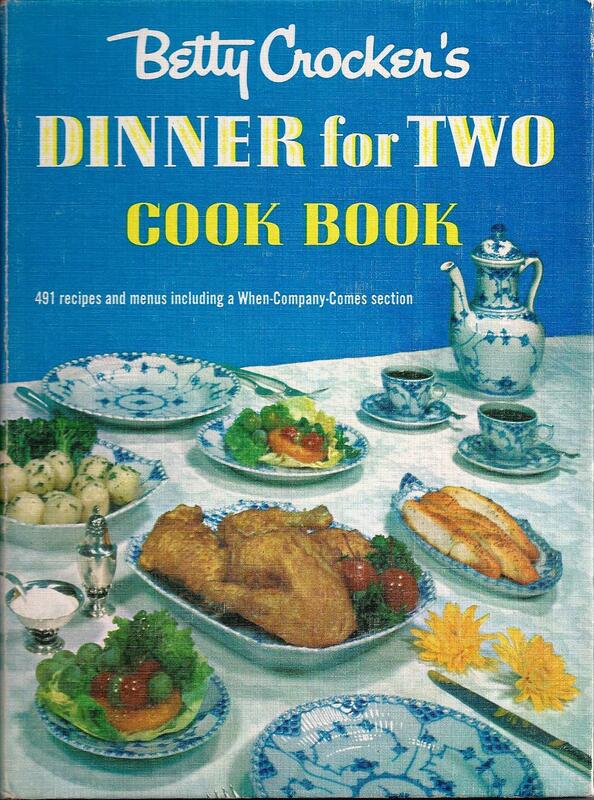 Most magazine recipes for two today really serve 3 or 4 people. Seeds last several years if stored carefully – only plant what you need. Happy weekend to you and yours also. I'm going to re-read this blog post a few times! I grew up as an only child with small cooking being the norm of the house. I then married someone who had a 13 yo son (6-2, 215#) and started cooking for six...really. Even after the kid left home, I continued larger quantities because the husband liked leftovers for lunch. I'm now divorced and trying to cook for one. I think I have diet fatigue because I'm having a hard time cooking small amounts for variety, ending up with a few days of leftovers. Bleh. Any sort of fresh veggies are a pain...they just don't keep long enough. That's also why I took your advice and upgraded the toaster oven....it just wasn't practical to heat that big oven up for a dab or two of something. And heaven knows my hips don't need two dozen chocolate chip cookies sitting around....lol. Thankyousoverymuch! for all you do!! Sometime it makes more sense as than you eat because it is something you want to eat. Our kids are still in the college/grad school years, but I have found more and more often that I need to scale down favorite meals. What was once sufficient for 2 hungry teens + 2 parents is now far too much food. And what I cook is not always freezable. Your tips are so practical, sensible and well-thought-out! I can see it is going to take conscious effort to adapt to this new "phase" of cooking--and it won't happen overnight. I am going to print out this and add it to my my binder of favorite recipes, so I can easily refer to it. Thanks, Myrna, Sue, and Bonnie! Great ideas and inspiration. I grew up cooking for 5 and with it being just me now, I need to cut things down as I am battling food fatigue also. I don't like to waste either. I decided that I would fix myself things that I like to eat that maybe the rest of the people didn't like and than it would be a treat and maybe I would eat more and better. At the least it would make mealtime more interesting. Good luck with your battle with meals in general. It's a challenge to find the strategies that work for each person...we hope at least some of these ideas will help. We're still on the journey of finding ways to cope with eating and cooking "small" in a "big food" world. It seems like "just right" is hard to find...either not eating enough or nutritiously or overeating are the problems with adjusting to cooking for fewer people. Terrific posting with many ideas to try since I am cooking just for one. Didn't realize how many of our readers are cooking for just one or two. Hope some of these ideas help.